SEPA Pty. Ltd. ("SEPA") provides this Internet Web site ("Site") for your browsing, information, and use. 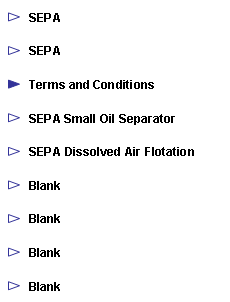 The text, pictures, images, graphics, brochures and other items provided by this SEPA Site are the intellectual property of SEPA and copyrighted by SEPA . By accessing this Site, you accept these SEPA Internet Web Site Terms and Conditions of Use as a legal agreement between you and SEPA. The contents and design of this website, including logos, trademarks are the property of SEPA Pty. Ltd. ACN 130 929 887, Sutherland NSW, Australia and are protected under copyright law and international treaty. All rights reserved. Except under the conditions described in the Copyright Act 1968 and subsequent amendments, no part of this website may be reproduced or transmitted by any process without prior permission in writing from SEPA Pty. Ltd. ACN 130 929 887, Sutherland NSW, Australia. Users can copy or download files from this website for personal use only. Reproduction and transmission of these files is not permitted. © 2010 SEPA. All rights reserved.